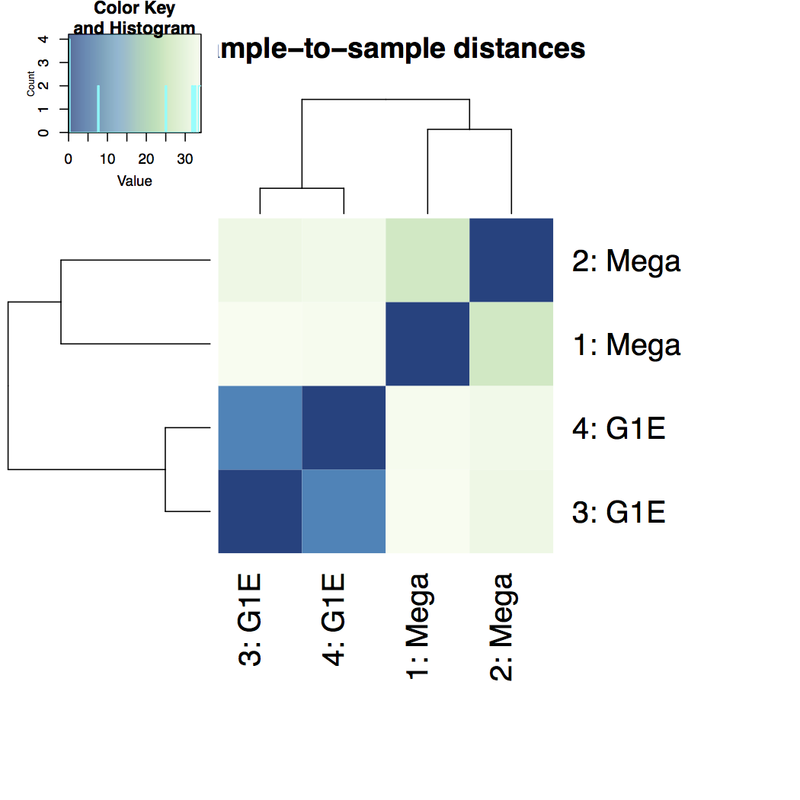 What genes are differentially expressed between G1E cells and megakaryocytes? How can we generate a transcriptome de novo from RNA sequencing data? The data provided here are part of a Galaxy tutorial that analyzes RNA-seq data from a study published by Wu et al. in 2014 DOI:10.1101/gr.164830.113. The goal of this study was to investigate “the dynamics of occupancy and the role in gene regulation of the transcription factor Tal1, a critical regulator of hematopoiesis, at multiple stages of hematopoietic differentiation.” To this end, RNA-seq libraries were constructed from multiple mouse cell types including G1E - a GATA-null immortalized cell line derived from targeted disruption of GATA-1 in mouse embryonic stem cells - and megakaryocytes. 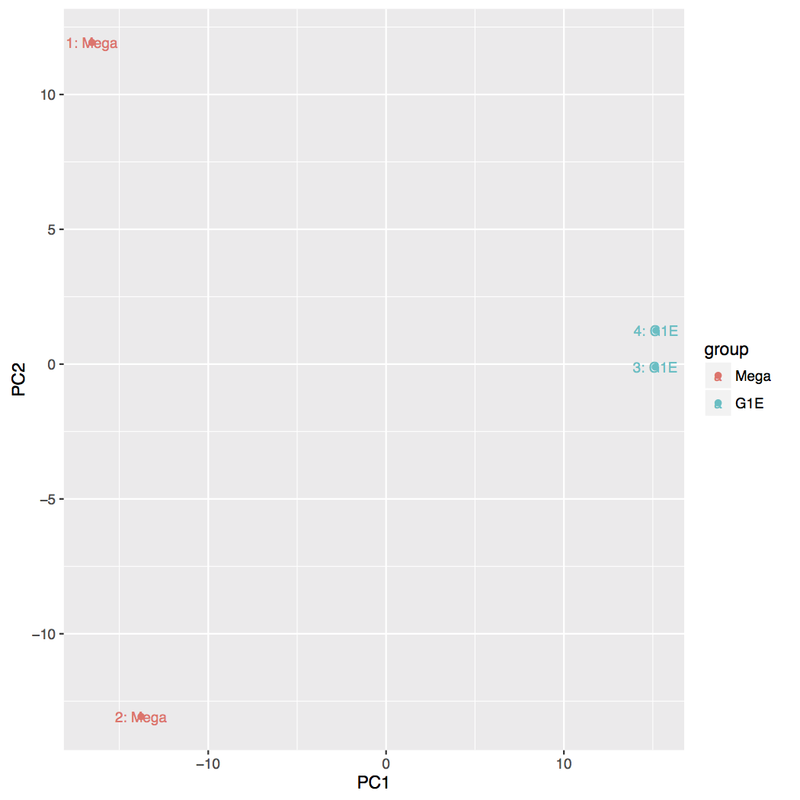 This RNA-seq data was used to determine differential gene expression between G1E and megakaryocytes and later correlated with Tal1 occupancy. This dataset (GEO Accession: GSE51338) consists of biological replicate, paired-end, poly(A) selected RNA-seq libraries. Because of the long processing time for the large original files, we have downsampled the original raw data files to include only reads that align to chromosome 19 and a subset of interesting genomic loci identified by Wu et al. The goal of this exercise is to identify what transcripts are present in the G1E and megakaryocyte cellular states and which transcripts are differentially expressed between the two states. We will use a de novo transcript reconstruction strategy to infer transcript structures from the mapped reads in the absence of the actual annotated transcript structures. This will allow us to identify novel transcripts and novel isoforms of known transcripts, as well as identify differentially expressed transcripts. Due to the large size of this dataset, we have downsampled it to only include reads mapping to chromosome 19 and certain loci with relevance to hematopoeisis. This data is available at Zenodo, where you can find the forward and reverse reads corresponding to replicate RNA-seq libraries from G1E and megakaryocyte cells and an annotation file of RefSeq transcripts we will use to generate our transcriptome database. By default, Galaxy uses the URL as the name, so rename the files with a more useful name. For quality control, we use similar tools as described in NGS-QC tutorial: FastQC and Trimmomatic. FastQC tool: Run FastQC on the forward and reverse read files to assess the quality of the reads. What is the read length? Is there anything interesting about the quality of the base calls based on the position in the reads? The quality of base calls declines throughout a sequencing run. FastQC tool: Re-run FastQC on trimmed reads and inspect the differences. The average quality of base calls does not drop off as sharply at the 3’ ends of reads. Now that we have trimmed our reads and are fortunate that there is a reference genome assembly for mouse, we will align our trimmed reads to the genome. Instead of running a single tool multiple times on all your data, would you rather run a single tool on multiple datasets at once? Check out the dataset collections feature of Galaxy! To make sense of the reads, their positions within mouse genome must be determined. This process is known as aligning or ‘mapping’ the reads to the reference genome. Spliced mappers have been developed to efficiently map transcript-derived reads against genomes. HISAT is an accurate and fast tool for mapping spliced reads to a genome. Another popular spliced aligner is TopHat, but we will be using HISAT in this tutorial. HISAT2 tool: Run HISAT2 on the remaining forward/reverse read pairs with the same parameters. Now that we have mapped our reads to the mouse genome with HISAT, we want to determine transcript structures that are represented by the aligned reads. This is called de novo transcriptome reconstruction. This unbiased approach permits the comprehensive identification of all transcripts present in a sample, including annotated genes, novel isoforms of annotated genes, and novel genes. While common gene/transcript databases are quite large, they are not comprehensive, and the de novo transcriptome reconstruction approach ensures complete transcriptome(s) identification from the experimental samples. The leading tool for transcript reconstruction is Stringtie. Here, we will use Stringtie to predict transcript structures based on the reads aligned by HISAT. Stringtie tool: Run Stringtie on the HISAT2 alignments using the default parameters. Use batch mode to run all four samples from one tool form. We just generated four transcriptomes with Stringtie representing each of the four RNA-seq libraries we are analyzing. Since these were generated in the absence of a reference transcriptome, and we ultimately would like to know what transcript structure corresponds to which annotated transcript (if any), we have to make a transcriptome database. We will use the tool Stringtie - Merge to combine redundant transcript structures across the four samples and the RefSeq reference. Once we have merged our transcript structures, we will use GFFcompare to annotate the transcripts of our newly created transcriptome so we know the relationship of each transcript to the RefSeq reference. Stringtie-merge tool: Run Stringtie-merge on the Stringtie assembled transcripts along with the RefSeq annotation file we imported earlier. 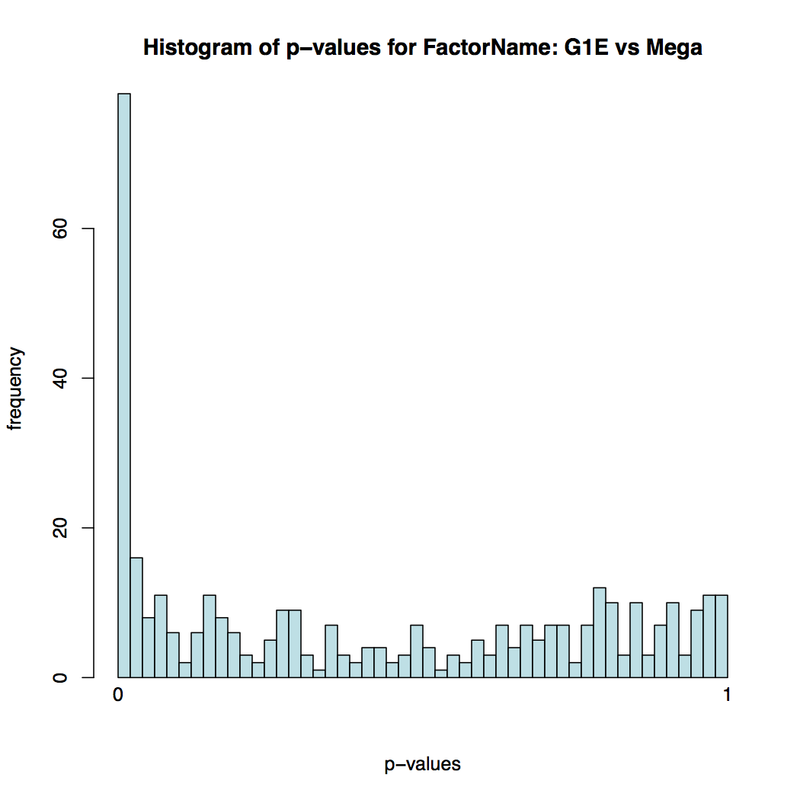 GFFCompare tool: Run GFFCompare on the Stringtie-merge generated transcriptome along with the RefSeq annotation file. e Single exon transfrag overlapping a reference exon and at least 10 bp of a reference intron, indicating a possible pre-mRNA fragment. We just generated a transriptome database that represents the transcripts present in the G1E and megakaryocytes samples. This database provides the location of our transcripts with non-redundant identifiers, as well as information regarding the origin of the transcript. We now want to identify which transcripts are differentially expressed between the G1E and megakaryocyte cellular states. To do this we will implement a counting approach using FeatureCounts to count reads per transcript. Then we will provide this information to DESeq2 to generate normalized transcript counts (abundance estimates) and significance testing for differential expression. To compare the abundance of transcripts between different cellular states, the first essential step is to quantify the number of reads per transcript. 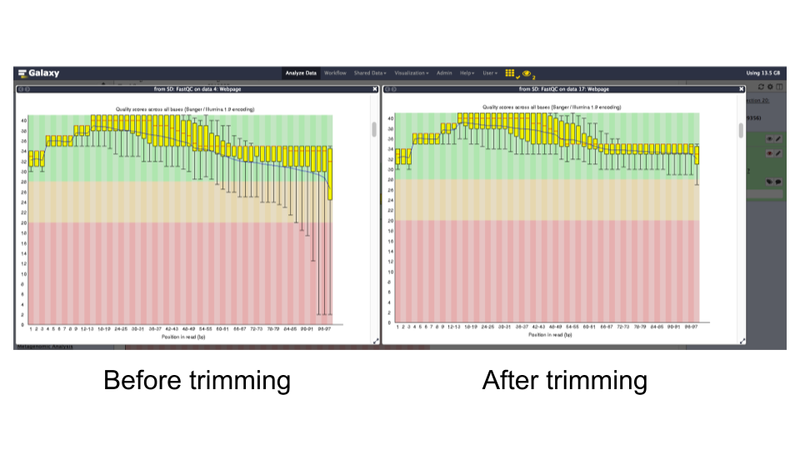 FeatureCounts is one of the most popular tools for counting reads in genomic features. In our case, we’ll be using FeatureCounts to count reads aligning in exons of our GFFCompare generated transcriptome database. The recommended mode is “union”, which counts overlaps even if a read only shares parts of its sequence with a genomic feature and disregards reads that overlap more than one feature. FeatureCounts tool: Run FeatureCounts on the aligned reads (HISAT2 output) using the GFFCompare transcriptome database as the annotation file. Transcript expression is estimated from read counts, and attempts are made to correct for variability in measurements using replicates. This is absolutely essential to obtaining accurate results. We recommend having at least two biological replicates. How many transcripts have a significant change in expression between these conditions? To filter, use “c7<0.05”. And we get 249 transcripts with a significant change in gene expression between the G1E and megakaryocyte cellular states. Filter tool: Determine how many transcripts are up or down regulated in the G1E state. Are there more upregulated or downregulated genes in the treated samples? To obtain the up-regulated genes in the G1E state, we filter the previously generated file (with the significant change in transcript expression) with the expression “c3>0” (the log2 fold changes must be greater than 0). We obtain 102 genes (40.9% of the genes with a significant change in gene expression). For the down-regulated genes in the G1E state, we did the inverse and we find 149 transcripts (59% of the genes with a significant change in transcript expression). 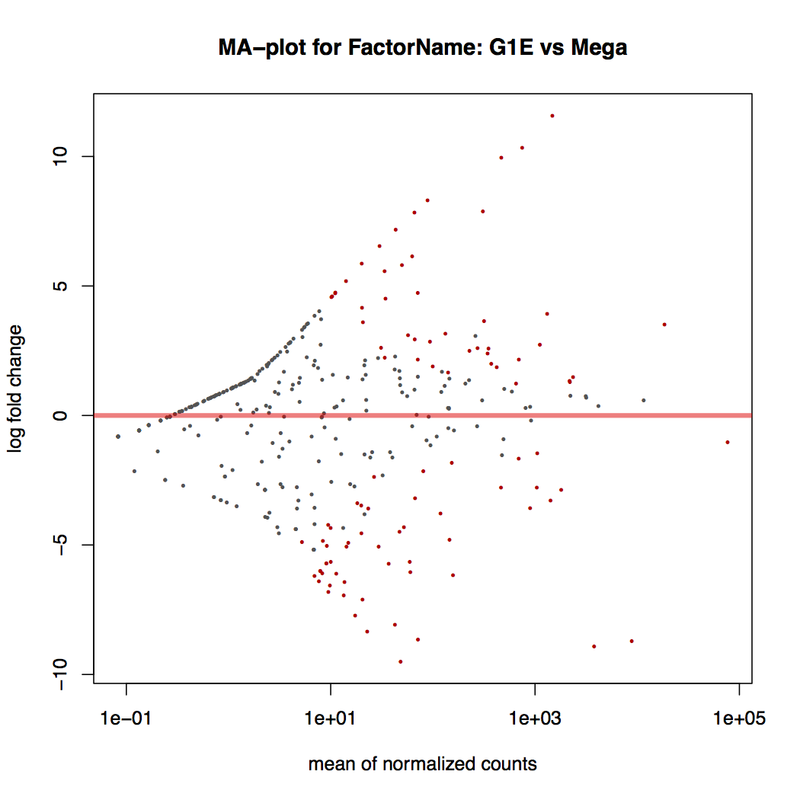 MA plot: global view of the relationship between the expression change of conditions (log ratios, M), the average expression strength of the genes (average mean, A), and the ability of the algorithm to detect differential gene expression. The genes that passed the significance threshold (adjusted p-value < 0.1) are colored in red. Each replicate is plotted as an individual data point. This type of plot is useful for visualizing the overall effect of experimental covariates and batch effects. 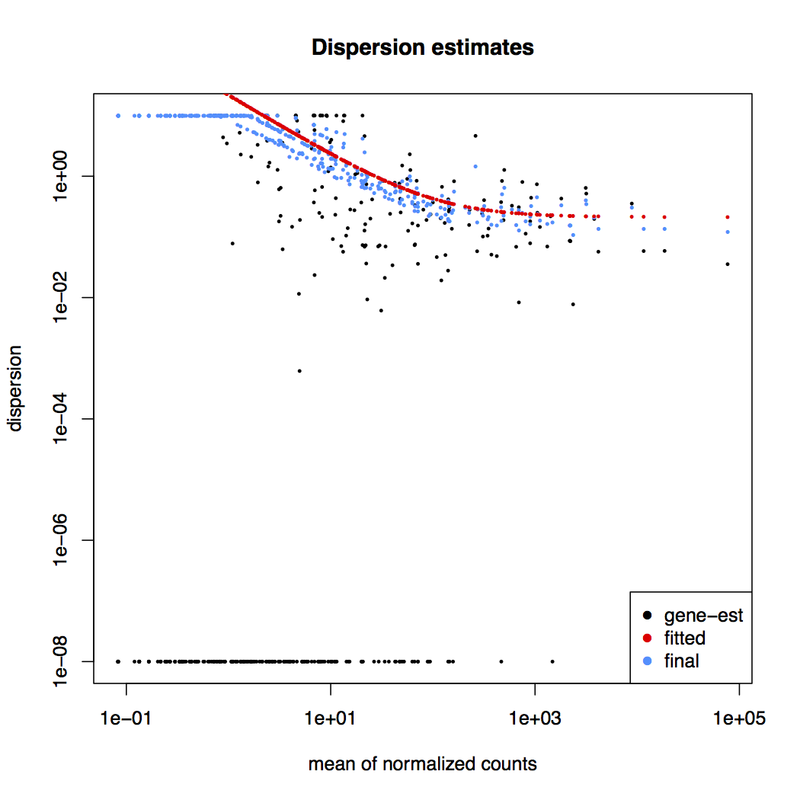 This dispersion plot is typical, with the final estimates shrunk from the gene-wise estimates towards the fitted estimates. Some gene-wise estimates are flagged as outliers and not shrunk towards the fitted value. The amount of shrinkage can be more or less than seen here, depending on the sample size, the number of coefficients, the row mean and the variability of the gene-wise estimates. For more information about DESeq2 and its outputs, you can have a look at DESeq2 documentation. Now that we have a list of transcript expression levels and their differential expression levels, it is time to visually inspect our transcript structures and the reads they were predicted from. It is a good practice to visually inspect (and present) loci with transcripts of interest. Fortunately, there is a built-in genome browser in Galaxy, Trackster, that make this task simple (and even fun!). In this last section, we will convert our aligned read data from BAM format to bigWig format to simplify observing where our stranded RNA-seq data aligned to. We’ll then initiate a session on Trackster, load it with our data, and visually inspect our interesting loci. Rename tool: Rename the outputs to reflect the origin of the reads and that they represent the reads mapping to the PLUS strand. Rename tool: Rename the outputs to reflect the origin of the reads and that they represent the reads mapping to the MINUS strand. tool: Using the grey labels on the left side of each track, drag and arrange the track order to your preference. tool: Hover over the grey label on the left side of the “RefSeq GTF mm10” track and click the “Edit settings” icon. tool: Repeat the previous step on the output files from StringTie and GFFCompare. tool: Hover over the grey label on the left side of the “G1E R1 plus” track and click the “Edit settings” icon. tool: Repeat the previous step on the other three bigWig files representing the plus strand. tool: Hover over the grey label on the left side of the “G1E R1 minus” track and click the “Edit settings” icon. tool: Repeat the previous step on the other three bigWig files representing the minus strand. tool: Adjust the track height of the bigWig files to be consistent for each set of plus strand and minus strand tracks. tool: Direct Trackster to the coordinates: chr11:96191452-96206029, what do you see? 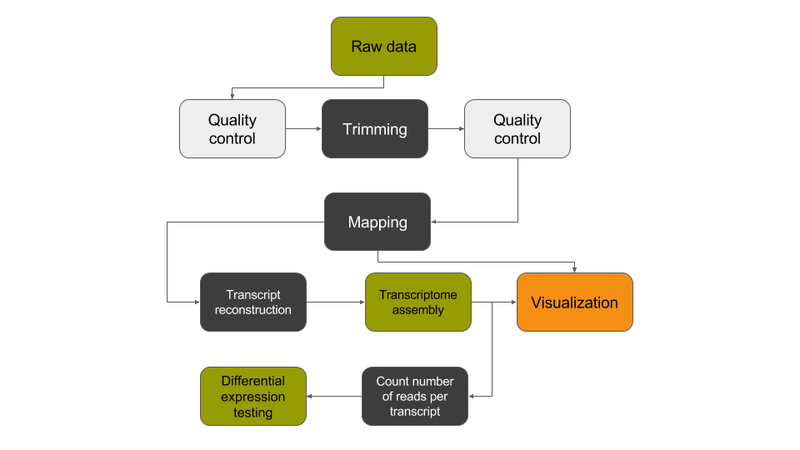 De novo transcriptome reconstruction is the ideal approach for identifying differentially expressed known and novel transcripts. Differential gene expression testing is improved with the use of replicate experiments and deep sequence coverage. Visualizing data on a genome browser is a great way to display interesting patterns of differential expression. This material is the result of a collaborative work. Thanks to the Galaxy Training Network and all the contributors ( Mallory Freeberg, Mo Heydarian)!